I’ve teamed up with a group of fabulous bloggers for a July Reader Appreciation Giveaway! 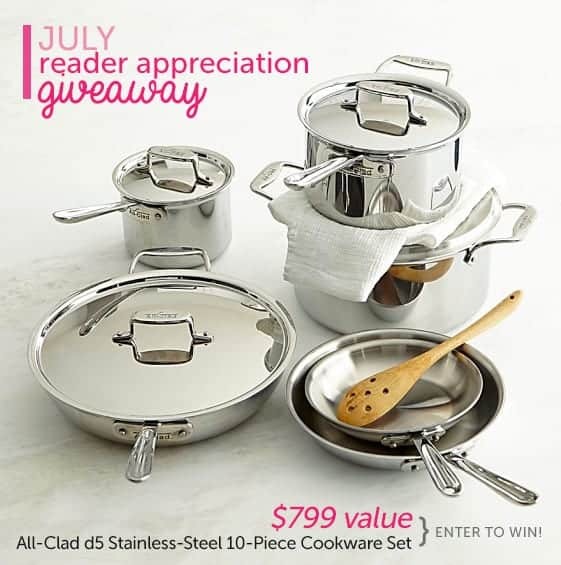 One lucky person is going to win a All-Clad d5 Stainless-Steel 10-Piece Cookware Set valued at $799. Enter on the form below. Good luck! Hope I could win this for my daughter. Wow Gorgeous Pans! Thanks for the opportunity to enter! I would give my 26 year old ones to my son for his college apartment. Would love to have new set of cookware. I could not enter because the form was not there for me and trust me, I tried>> it would be thrilling to have a chance to win the best>>All-Clad. Blessings to the one that gets it! I don’t do Instagram 🙁 I’ll need a lot of luck. My daughter really needs this. I don’t Instagram. Oh will at least got one entry. Great giveaway any way. I would love to win. I’m still using the pots and pans my husband had from his bachelor days 32 years ago. My original set needs replacing, perfect timing to win Thanks to all bloggers! What a beautiful set of cookware. I am sure anyone would be happy to win this. I’m still using 45 year old pots and pans; would love some new ones. Thanks for the chance. Nice looking cookware. Maybe my meals will be less over cooked with these pots. keeping my fingers (and toes) crossed! Would love to win this beautiful cookware set!! I would love to give this great cookware set to my daughter as a house warming present…she’s moving into her first house very soon. They look so beautiful!! would love to update my current stuff!! I follow thelittlekitchn on Instagram; unfortunately, when I click in the widget, I get “Forbidden” I’d be pleased to get the entry, if there’s anything you can do about it. Thank you. I would love to win this for my daughter who just got her own place. What, this is really a giveaway. Sign me up, can wait to start cooking. If I win, this will be for me. I have been wanting an All Clad cookware. Cooking would be such a pleasure. I really love cooking, and this would be a great addition to my kitchen. Which is now due for such an addition. ‘instagram’ requires you to have a ‘smartphone/tablet’ and i can’t afford these. is there a reason it is only ‘instagram’ links? Pinned and tweeted. I still like my set I have had for 20 years, but I could use a nicer set. A new set of cookware would be great, I have never owned a new set, just a new pot or pan and nothing matches. Would be great for family dinners.